The next generation of Scotty Cameron Select putters are engineered for performance, milled to precision and designed with elegance. 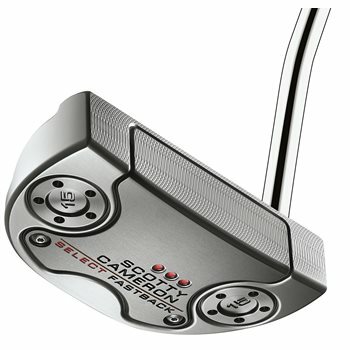 Scotty Cameron’s proven multi-material construction methodology of combining face inlays of either 303 stainless steel or 6061 aircraft-grade aluminum with stainless steel bodies provide superior balance, weight distribution, sound and feel. Featuring new four-way sole balancing technology, each 2018 Select putter sits perfectly square at address to promote easier alignment on virtually any lie. The Select Fastback has a single milled flange line giving it a cleaner, Tour-preferred look at address and allowing for additional vibration dampening between the sole and the putter body.